The Spanspüler® differs from conventional flushing heads due to its two overlapping flushing slots that are located side by side. Thanks to the chamfered ends of the slots, the cooling lubricant used for flushing, exits in a fan-shaped manner. This results in a three-dimensional cleaning effect. 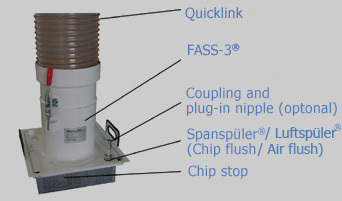 The combined action of the two fan-shaped flashing pulses is highly effective. Download brochure (pdf)! Click the picture below for a simulation of the mode of operation of the Spanspüler®! 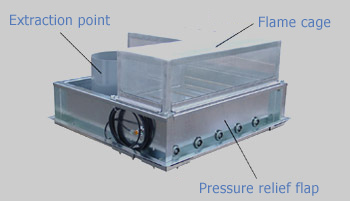 Collecting tank for cooling lubricant with metal sludge in form of a glass cylinder. 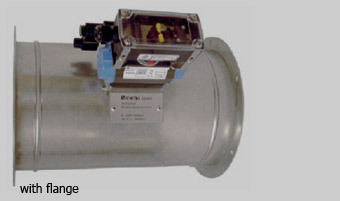 It is equipped with ultrasonic monitoring and empties automatically. 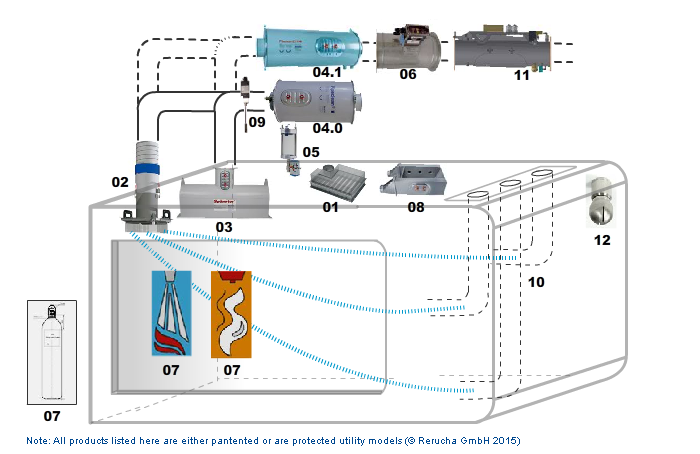 Download brochure (pdf)!Click the picture below for a simulation of the mode of operation of the Fluidbagck®! 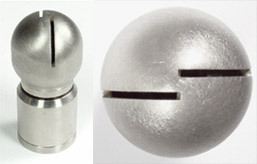 When the ventilation technology is put directly into the working area, one or more air supply nozzles can be placed in optimum positions. The resulting air short circuit between the extraction point and the air nozzles transports the cooling lubricant mist (or dust) towards the extraction point. Air is only drawn in behind! In addition, cooling lubricant mist (dust) from behind the nozzle is removed due to the injector effect. Download brochure (pdf)! Click the picture below for a simulation of the mode of operation of the Airstep®! The standardized extraction interface prevents carry-over of chips. Thanks to automatic cleaning, the entire extraction surface is available at all times (safety relevant for cooling lubricant oil!). Download brochure (pdf)! With Spänetor®, chips are no longer extracted! 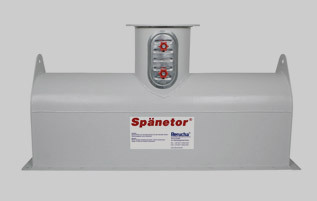 Thanks to the technology of the Spänetor®, the chips are returned to the machine immediately. When Spänetor® is used, 25% less air throughflow is required (= a significantly lower investment for the acquisition of extraction systems). The effectiveness (= the required air exchange in the working area) is absolutely equivalent. In addition, the air velocity at the extraction point is ≤ 4m/sec. (presuming correct design). - to prevent that fire-extinguishing agent is extracted from the "ignited" machine by the still running central extraction system. - to prevent that fire, which may not yet have been extinguished, is drawn into the central filter system. For machine tools that operate with cooling lubricant oil or minimum quantity lubrication and without fire extinguishing systems. The machine is cleared via a central extraction system. Download brochure (pdf)! Click on image below to enlarge it! 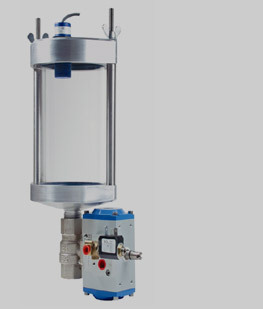 Mechanical pre-separator for oil, emulsion and water mist (without additives). No build-up of cooling lubricant! The condensed cooling lubricant (cooling lubricant reconditioning) is immediately returned to the machine. Download brochure (pdf)! 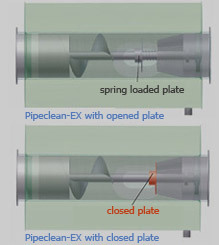 Pipeclean-EX® prevents flashover of jet flames into central extraction pipes! 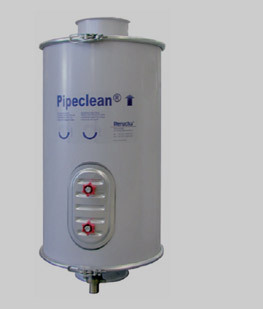 When Pipeclean-EX® is used, the central extraction system can be operated without danger and all connected machines continue producing without interruption. With the already familiar "system guarantee" we assure the specified properties and functions! Download brochure (pdf)! 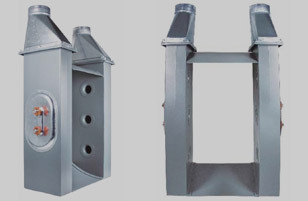 Fire extinguishing systems for a range of different requirements. When loading hatches are opened quickly for workpiece or tools change, the cooling lubricant mist escapes suddenly from the working area of the machine and contaminates the air of the production hall, in which people are working. The air spins around and a cyclone is formed that prevents the cooling lubricant mist (oil or emulsion) from escaping. Therefore, fitting to the machine is simple. There are a couple of things that have to be taken into consideration. Product videos Download brochure (pdf)! The pressure release flap has the task to reduce the pressure wave in the event of deflagration and explosions in machine tools. Download brochure (pdf)! EC-type-examination-certificate according to ATEX guidelines. Lupo®is a new air positioning system and has been designed for the following applications: Exhaust air ducts with air flow velocities of 10-22 m/sec., cooling lubricant concentration < 400 mg/m3 , particles ≤ 400 µm, gas phase concentration < 1000mg/m3, static pressures < 50mbar Download brochure (pdf)!